Below is a list of key documents, studies and other resources related to the proposed Rosemont mine. The materials were specifically prepared as scoping comments in order to assist the Coronado National Forest and their associated consultants in preparing a Draft Environmental Impact Statement that incorporated a full discussion of the economic and non- market costs and benefits of the proposed Rosemont Copper Project. “Tom_Power_Report_Combined” contains five separate scoping comment papers prepared by Dr. Powers. This submittal of scoping comments also includes a copy of the Powerpoint presentation “Rosemont_presentation_Tucson” given by Dr. 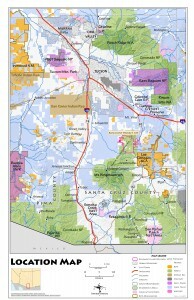 Powers at a Tucson meeting of the Coronado National Forest – Rosemont Interdisciplinary Team, and Cooperating Agencies on June 30, 2010, and to members of the community at public meetings in Sonoita and Tucson on June 30 and July 1, 2010. An EARTHWORKS white papger summarizing and analyzing the groundbreaking studies by Ann Maest, PhD and Kim Kuipers, P.E.